How does a 40 Gbit/s Ethernet interface process packets in silicon? 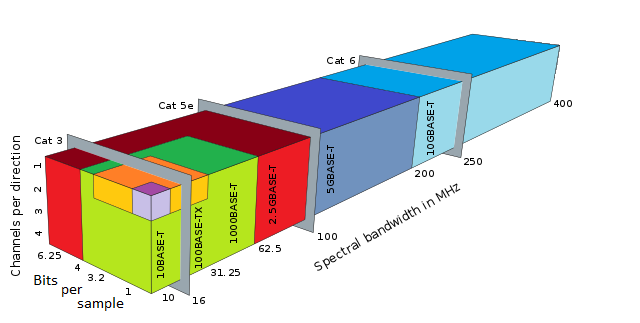 A 40 Gbit/s Ethernet interface should have a 40 GHz signal on it. How does common silicon IC technology handle such an exotic beast? My best guess is that internally various parallel busses are used, but I haven't found much on the internals of these things. 40G Ethernet does all of this: according to Wikipedia, it uses 4 channels, running at 1.6GHz each and transmitting 6.25 bits per clock cycle, which results in 40Gbit/s of total bandwidth. 40G Ethernet is really four physical 10G links running in parallel. Modern FPGAs have SERDES hardware that can run at well over 10 Gbps, and it's common to use four 32-bit buses running at 312.5 MHz inside the FPGA. That gives you a data rate of exactly 40.000 Gbps. Check out the IEEE red-rag, the Journal of Solid State Circuits, in the library. Almost every issue has 40GigaBit receiver discussions. Not the answer you're looking for? Browse other questions tagged digital-logic ethernet optoelectronics or ask your own question. How to route Gigabit Ethernet, remote PHY or remote RJ45 connector?